The wine estate Rolly Gassmann is situated just North of Colmar in Alsace and the cellar is found in the tiny village of Rorschwihr. The Gassmann family has been making wine in Rorschwihr since 1676. It's a common mistake to think there is a Mr. Gassmann whose first name is Rolly. The Rolly Gassmann estate was created in 1967 when Marie-Thérèse Rolly married Louis Gassmann. The family tree goes back to 1611 for the Gassmann from Rodern and 1676 for the Rolly from Rorschwihr. Since 1997 Pierre, Marie-Thérèse and Louis's son, runs the 128acre/52ha wine estate located in Rorschwihr. The estate is nurtured by 15 people working all year around in the vineyards. 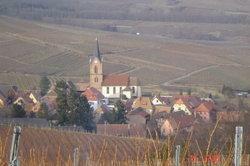 The vineyards are situated in three municipalities; Rorschwihr, Bergheim and Rodern. Rolly Gassmann converted to the biodynamic philosophy around 1997 and Pierre Gassmann is a founding member of the Vignes Vivantes, 'the living vineyards', which is a regional composting body. The winery produces about 200 000 bottles each year with 90% of white wines and 10% of reds.